1 - Students who are not in session will NOT be accommodated. All needy students are invited to apply for the Rattansi Educational Trust bursary through the Student Portal (Services | Rattansi Bursary). Application will open from 8th March, 2019 at midnight and will close on the midnight of 13th March 2019. Completed applications should be forwarded to the office of the Director Student Support Services LATEST Friday 15th March, 2019 by 5:00pm. Please note that late applications will not be considered. 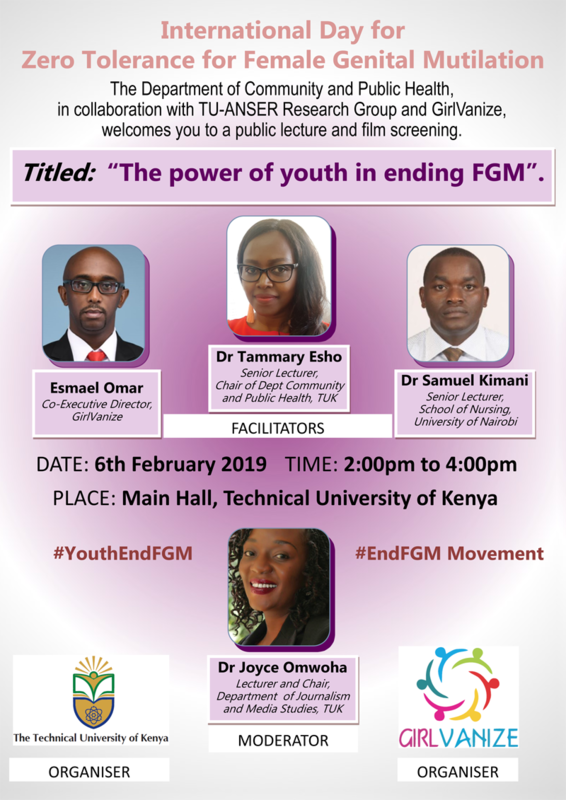 The Department of Community and Public Health, in collaboration with TU-ANSER Research Group and GirlVanize, welcomes you to a public lecture and film screening. elections on Wednesday, 13th February, 2019 and Thursday, 14th February, 2019. Kindly note that only those whose names appear on the class list shall be allowed to vote. NOTE: All deadlines MUST BE OBSERVED and no action after the deadline shall be considered. 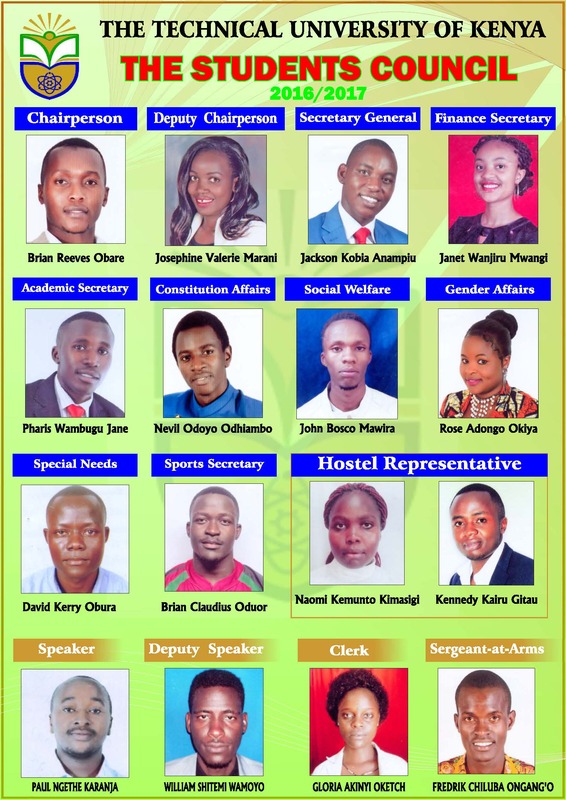 The SATUK 2019/2020 elections are scheduled to take place on Thursday, 14th February, 2019 from 8:00 a.m. to 3:00 p.m. This will be preceded by the election of delegates by each academic department on 13th February, 2019 from 6:00 a.m. to 1:00 p.m. The 6th Graduation Ceremony will be held on Tuesday 18th (for TVET) and Friday 21st December (degree). c)	Any other relevant document that may assist in proving your level of need. FirstIdea Consulting is a Management Consulting Company specializing in Risk Management Consulting. They are seeking to recruit interns with the aim of training them for full time employment based on their performance. Students are notified to send their CVs that fit the profile attached. All continuing students are hereby notified to register for HELB Smart Cards by FRIDAY 19TH OCTOBER, 2018 through the Student portal. 1. All students must re-upload a recently taken passport photograph with a WHITE BACKGROUND. 2. Update the portal details and especially THE NATIONAL ID NUMBER. Special and Supplementary examinations will be administered from Monday 15th October 2018 at the University. The Registrar (Academic), has reminded students that special and supplementary examinations are administered only once during an academic year adding that anyone who misses the examinations, will have to wait until the following academic year that usually begins in September. Prospective graduands should clear not later than Wednesday 31st Oct 2018 to be allowed to graduate. Clearance requirements can be accessed online on: Fee Statement Link under personalised forms. Be advised that only those who would have cleared by deadline day will be listed to graduate. Suicide is the result of a convergence of risk factors including but not limited to genetic, psychological, social and cultural risk factors, sometimes combined with experiences of trauma and loss. This is to inform all students that End-of-Semester University examinations are continuing tomorrow as previously scheduled. Please note that today's examinations that failed to take place because of students' disturbances shall be re-scheduled and new dates communicated as appropriate. Consequently, all bonafide students who are eligible to sit for the end-of-semester examinations are expected to report for the examinations as previously scheduled. Female students in the School of School of Physical Sciences and Technology are hereby notified to apply for a position of School Representative effective 19th July 2018. Application forms are available on the Student Portal and can be downloaded using the link 'SATUK Elections' under 'Services' menu. Deadline for submission is 27th July 2018. All needy students are advised to apply for SATUK Bursary from 12th June 2018. Forms MUST be completely filled online through the Students' Portal by midnight of 19th June 2018, with all supporting documents attached and MUST be submitted to the Office of the Academic Secretary on or before Wednesday, 20th of June 2018. Kindly comply. NB- THOSE WHO HAVE BEEN IN RESIDENCE SINCE JANUARY MUST RE-APPLY TO BE CONSIDERED, FAILURE TO APPLY WILL MEAN IMMEDIATE VACATION OF THE ROOM. Applications for the Programmes should be made by completing an online application form available on the Technical University of Kenya application portal: http://intake.tukenya.ac.ke. All Delegates to return the name tag pockets to the Directorate of Students Support Services office by 12 Noon Tuesday 13th March 2018 for fresh name labeling. Following the inconclusive SATUK Elections, the Electoral Board has rescheduled the election for the Chairperson and Vice Chairperson. The election will take place on Wednesday 14th March 2018 at 9:00am in the Lecture Theatre. All the duly elected delegates who participated in the Thursday Elections are expected to assemble in front of the staircase to the Lecture Theatre at 8:00am for verification and clearance. The SATUK 2018/2019 Electoral Board regrets the delay in commencing the voting for School Representatives and the SATUK Council. This was occasioned by a mix up in the printing of ballot papers for the School Representatives. The Electoral Board refused to pick the ballot papers with anomalies and demanded that the printer should correct the anomaly on the ballot papers by separating the Female Aspirants and the Male Aspirants. This has since been done and the corrected ballot papers are already here. The elections will commence immediately. Due to unavailability of moderators and concerns raised about the planned debate, we have cancelled the debate. All other scheduled activities will proceed as earlier communicated. This is to inform all bona fide students that, to be identified as a voter, a valid student ID shall be required. Those without IDs shall require authentication from the Admissions Office. Also, female candidates from all departments interested in being elected as delegates in the Electoral College, are hereby requested to apply for the posts. The national Essay competition is open to universities and college students under the age of 35 years. This year's theme is " Role of Quality Infrastructure and Standardisation in facilitating Trade and sustainable Development within the African Continental Free Trade Area (CFTA)". The TUK Electoral Board has noted with concern that candidates who applied for the posts for School Representatives and SATUK Chairman did not submit their nomination forms to the Director Student Support Services as required. Some Schools will therefore not have representation as stipulated in the SATUK Constitution. The TUK Electoral Board has noted with concern that, most candidates who applied for the posts for School Representatives did not submit their nomination forms to the Director Student Support Services as required. Also, the number of female students vying for elective posts is significantly low, and as stipulated in the SATUK Constitution, the two-thirds gender rule threshold may not be met. All needy students are invited to apply for the Rattansi Educational Trust bursary through the Students’ Portal (Services | Rattansi Bursary Form). The application will open from 5th to 20th February, 2018 at 5:00pm. This is to inform you that the deadline for returning all the nomination forms shall be on Monday 5th February, 2018 by latest 3:00pm. Nominees for the Electoral College delegates shall submit the forms in their respective departments while nominees to various SATUK offices shall submit their forms to the Director Student Support Services. Please note that late submissions shall not be accepted. It has come to our notice that some students are using other students’ credentials to gain unlawful access to their accounts. This has resulted in cases of alteration of student account details and even initiation of fraudulent communication. Such actions are not only unethical, but also criminal, and must stop forthwith. The SATUK Elections are scheduled to take place on 8th March, 2018. The Students Portal for nomination of candidates vying for various SATUK Elections posts will be open from tomorrow Wednesday 24th January, 2018 at 12:00 noon. All eligible candidates are thereby asked to fill their nomination papers and deliver them to the undersigned by latest 2nd February, 2018 12:00pm. I take this opportunity to inform you that the SATUK Constitution 2013 which has been under review was approved by the University Management and shall subsequently be promulgated in a ceremony to be presided over by the Vice Chancellor, in the presence of senior officers of the University and SATUK officials on Wednesday 24 th January, 2018 from 10:00am in the Main Hall. You are all invited to this auspicious ceremony. Voters: All bona fide members i.e. students who are fully paid up members of the union and hold an original University Identity Card. Mode of voting: Secret ballot. Voter Identification shall be through a valid student’s ID. Voters will be checked in online by the Presiding Officer using the university system. Counting of votes will commence immediately the voting is completed at 3.00 pm. Happy New Year 2018! The old year is gone and behold the New Year is here with us. It is another opportunity for us to plan and refocus our efforts towards achieving our dreams. Naturally, many of us will set new goals as we strive to live a better life. As we do this let us take stock of the achievements of goals we set last year and ask ourselves whether we met these objectives. If not, then why did we not achieve them? The Graduates of December 2017 are hereby informed that a number of them have had their suggested names to appear in their degree certificates rejected especially those that did not match names on their KCSE certificates. The names posted here correspond with the set criteria and they are the ones to be used in printing academic certificates. The Technical University of Kenya (TU-K) wishes to announce that the reporting date for ALL continuing students will be 2nd January 2018. Registration: ALL continuing students are required to register online for the remaining part of the academic year 2017/2018 to process their student ID cards with immediate effect. All members of staff are notified that teaching, learning and normal University operations will resume on Tuesday 2nd January 2018. The University has rolled out WiFi to TUK community. To access the WiFi network, select 'TUK-Students'. For username, use your full Admission Number and for password, use your national ID/Birth certificate/Passport number. Those who are unable to login should visit the Office of Student Recruitment and Admissions to update their details. The Technical University of Kenya is pleased to announce the 5th Graduation Ceremony to be held on Tuesday 19th and Thursday 21st December 2017 at 9.00 a.m. This is to inform you that members of the Counselling unit under the Director Students Support Services (Dean of Students) shall be available every weekday from 8:00am to 5:00pm to offer confidential counselling services to any member of staff or from the students fraternity who was affected by any form of violence either directly or indirectly (by witnessing or hearing narratives from close family or friends) during the repeat presidential election process. Transport and Lifting Services Ltd is a motor dealer with presence in East Africa. They are looking to add to their human resource capital and to this end are inviting interns and job seekers from among TUK students in the field of AUTOMOTIVE ENGINEERING (MECHANICAL & ELECTRICAL). Interested candidates are requested to share their curriculum vitae (CVs) to anthony@tnl.co.ke for vetting and recruitment. 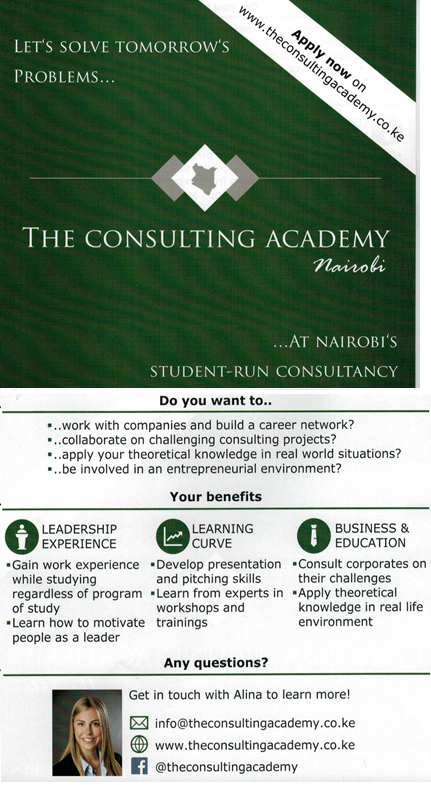 All students who wish to develop leadership and entrepreneurial skills while still studying are requested to take note that "The Consulting Academy" shall be distributing fliers and answering their questions on Wednesday 13th September, 2017 and Thursday 14th September, 2017 from 8:00am-4:00pm. Students who have pending special or supplementary examinations are advised to liaise with the Chairpersons of their respective Departments to access the timetable. The examinations will be administered from Monday 11th September 2017. Students are reminded that special/supplementary examinations are administered once in an academic year and there shall be no special considerations. The newly-admitted First Year students should report on Thursday 7th September 2017 to start their orientation which will run up-to and including Saturday 9th September 2017. Registration for First Year students will be on-going up-to and including Friday 1st September, 2017. The Technical University of Kenya (TUK) wishes to inform First Year students, admitted through KUCCPS and directly by TU-K, that due to unforeseen circumstances, the reporting date has been set for Monday 28th August 2017. Consequently, orientation programme has been amended to start on 28th August 2017. Early registration is still ongoing until Friday 25th August, 2017. Prospective students who applied for admission but have not received any feedback are advised to wait for communication that will be sent to them in the week starting 28th August 2017. All Public Universities and Constituent University Colleges are hereby informed and notified that the fresh reopening date for all Public Universities is Monday 28th August, 2017. Consequently, academic activities and programmes that were to resume as from Monday 21st August, 2017 should be adjusted accordingly by the respective University Senates and Constituent University College Academic Boards. Students who will not be successful in securing TU-K Hostel are advised to seek for ALTERNATIVE ACCOMMODATION. You can apply for vetted private hostel in Nairobi through this link You are encouraged to visit the hostels before making a commitment. The Directorate of Student Support Services is seeking to formulate a Special Needs and Vulnerabilities Policy for students in TUK. The policy will prescribe ways in which needy and vulnerable students can be assisted while studying at the university through different engagements including work study, bursaries etc. Responses on your experiences and expectations in TUK will assist the university in identifying and facilitating such students. Bright female students studying science subjects and from disadvantaged financial background are invited to apply for the Joe Wanjui Educational Trust Fund through the Student Portal (Services |Joe Wajui Bursary). The application will open from Tuesday 25th July, 2017 and close on Monday 31st July, 2017 at 5:00pm. This is requirement for Commission of University Education. All students wishing to be accommodated in the hostels during the September-December 2017 Semester should apply online from 24th July 2017 to 11th August 2017. Those who will not have applied online by this date will NOT be considered. Please note that terms and conditions for eligibility will apply. This is to bring to your attention amendments to section 41 of the Universities Act, 2012 herein referred to as THE UNIVERSITIES (AMENDMENT) ACT, 2016 which took effect from 13th January, 2017. In order to improve the teaching and learning experience, the Technical University of Kenya wishes to collect feedback from all students on courses taught as well as the lecturers. The TECHNICAL UNIVERSITY OF KENYA in collaboration with the UNIVERSITY OF NOTTINGHAM HILL (UK) is pleased to invite all staff and students to a PUBLIC LECTURE on Female Genital Mutilation that will be given by the MAYOR OF NOTTINGHAM tomorrow Friday 5th May, 2017 at 4:00pm in the MAIN HALL. Come join us for this informative talk and get insights into this public health issue that is increasingly getting global attention towards accelerating its abandonment. All needy students are advised to apply for SATUK Bursary from 25th April 2017. Forms MUST be completely filled online through the Students' Portal, with all supporting documents attached and MUST be submitted to the Office of the Academic Secretary on or before Wednesday 3rd of May 2017 . Attracting and retaining top talent is essential for Deloitte. Deloitte purposes to make an impact that matters, our talent brand captures the essence of how purpose driven individuals can expect to make an impact at Deloitte. Deloitte is invited is delighted to invite you to participate in the 2017 Deloitte graduate recruitment drive. The drive seeks to attract top talent from local universities to join the firm. The following list contains names of students/graduated students who have not added their details as required by Commission for University Education. The details required are KCSE index number, year of KCSE and national ID number. These data are entered through fee statement portal. Deadline is strictly 3rd March 2017. Those who fail to supply information will not receive further government support if students. As part of the process of establishing the University Anthem, the office of the Executive Dean, Faculty of Social Sciences and Technology, invites submissions of songs for consideration. All needy students are invited to apply for the Rattansi Educational Trust Bursary through the Student Portal (under Services | Rattansi Bursary Form). The application will open from Monday Friday 23rd December, 2016 and will close on Monday 16th January, 2017 at 4:00pm. TU-K will hold the 4th Graduation Ceremony on Friday 16th, December, 2016 (Diploma and Certificate graduands) and Tuesday 20th December, 2016 (Degree graduands). Click here to view the graduation list. The list is for all those who have attained academic qualification. All those names will appear on the graduation book. However, to pick gowns, graduands must clear fees and print application to graduate form. Students pursing Bachelor of Commerce are advised to register for their specialization online with effect from Monday 21 st November 2016 with a deadline of 25th November 2016. Select your specialization and submit. In order to streamline management, recognition and posterity of the above mentioned bodies in TU-K, all officials are hereby advised to apply for renewal and recognition of their clubs by the University. This is to remind all bona fide Class Representatives to register their details online by completing the “Class Reps Sign-up Sheet” available online on the students’ portal and return it to their respective CoDs/lecturers for confirmation and endorsement. The portal will be accessible from Monday 7th November, 2016 and the deadline for registration shall be by close of business on Thursday 10th November, 2016. All students wishing to be accommodated in the hostels during the January-April 2017 Semester should apply online from 14th November 2016 to 4th December 2016. Those who will not have applied online by this date will NOT be considered. Please note that terms and conditions for eligibility will apply. All needy students are advised to apply for SATUK Bursary from 1st November 2016. Forms MUST be completely filled online through the Students' Portal, with all supporting documents attached and MUST be submitted to the Office of the Academic Secretary on or before Monday 14th of November 2016 . Congratulations to all the candidates who succeeded in the SATUK 2016/2017 General Elections. All the results have been availed on the Students' Portal. Any candidate who has a legitimate complaint regarding the outcome of their results is hereby advised to lodge an appeal WITHIN 72 HOURS to the Chairman of the Elections Petitions Panel as stated in ARTICLE 16 of the SATUK Constitution on ELECTION PETITIONS. Appeals should be submitted to the Director, Students Support Services. Students are requested to confirm their eligibility to vote through the Students Portal. Those whose names do not appear on the online Voter Register should contact the Office of the Academic Registrar. We wish you a peaceful election. This is to inform you that the TU-K Great Debate scheduled to take place tomorrow in the Main Hall from 2:30pm to 4:00pm has been cancelled due to logistical reasons. There are over twenty (25) candidates vying for Chairperson, Deputy Chairperson and Secretary General and each aspirant may not get a fair share of the time allocated to articulate their visions. This is therefore to wish you all the best of luck in the forthcoming elections. Campaigns officially begin after a candidate has been duly cleared. 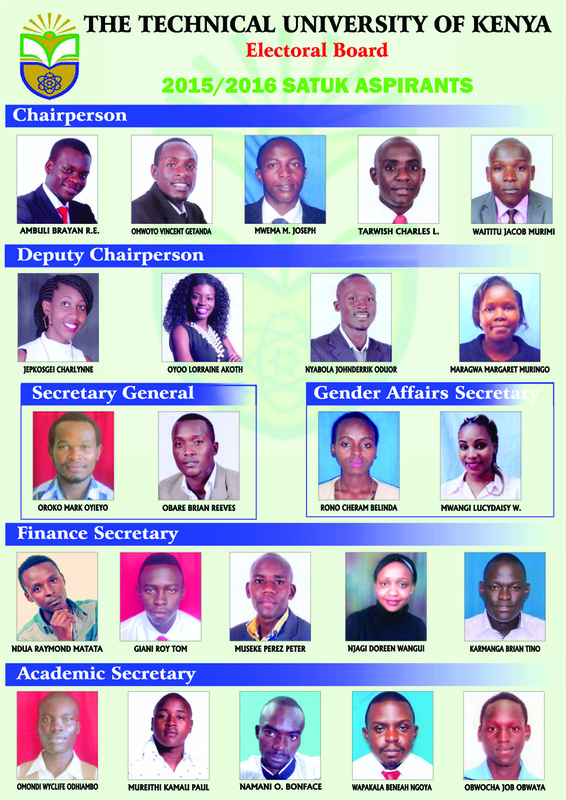 Candidates must abide by all University rules and regulations and laws of Kenya. A duly nominated candidate shall ensure that posters and all campaign materials are only put on the Notice Board and designated areas. No candidate or their agents may use glue for displaying posters and other campaign materials. Only masking tapes may be used. Subject to the Electoral Rules 2016/2017, notice is hereby given to all SATUK 2016/2017 aspirants to desist from campaigning within the Administration Block. Gluing/sticking of posters on the walls is strictly prohibited and any candidate whose posters are found on the walls will be surcharged for the damages caused including the cost of repainting. Please note that any candidate who willfully violates these electoral rules shall be automatically disqualified. You are also reminded to maintain peace and order during the entire campaign period. Wednesday 3rd October, 2016 and the deadline for registration of all bona fide class representatives is by close of business on Wednesday 12th October, 2016. The meeting between the Deputy Vice Chancellor, ARS, and the 2016/2017 SATUK Aspirants that was to be held today 3rd October 2016 has been cancelled. The following candidates were vetted and have FINALLY been cleared by the Electoral Board to run for the posts as indicated. The following candidates were vetted and have been cleared by the Electoral Board to run for the posts as indicated. Students still in need of Hostel Accommodation should visit the Office of the Assistant Director, Catering and Accommodation, between Monday 26th September and Thursday 29th September 2016 : 10am - 1pm. 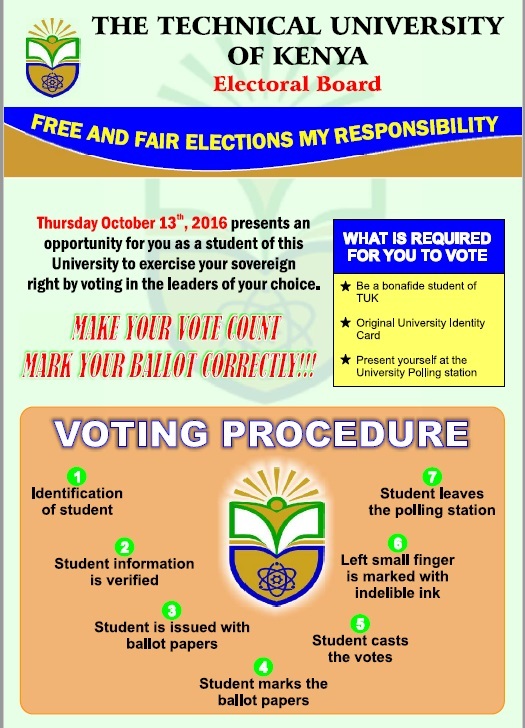 Thursday October 13th, 2016 presents an opportunity for you as a student of this University to exercise your sovereign right by voting in the leaders of your choice. All candidates should observe article 13(d): qualifications for the candidates for election. All students wishing to be accommodated in the hostels during the September-December 2016 Semester are requested to apply online from 19th July, 2016 to 7th August, 2016. Those who will not have applied online by this date will NOT be considered. 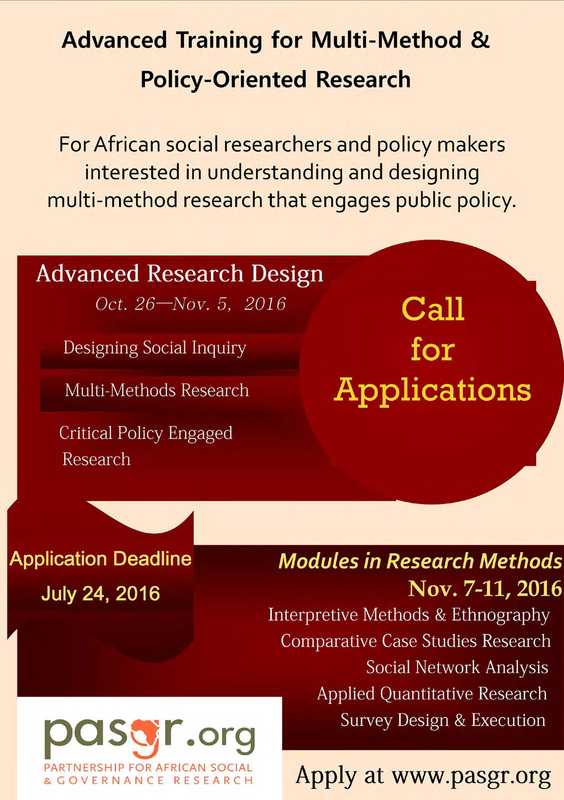 For African social researchers and policy makers interested in understanding and designing multi-method research that engages public policy. SATUK Constitutional Review is in progress. Students are kindly advised to send their comments to dean_students@tukenya.ac.ke. Deadline for submission is Fri 24th June 2016. The revised SATUK Constitution can be accessed via this link http://tukenya.ac.ke/sites/default/files/downloads/revised-satuk-constitution-2016.pdf. Student Association of the Technical University of Kenya (SATUK) invites interested eligible service providers to tender as contained in this document. 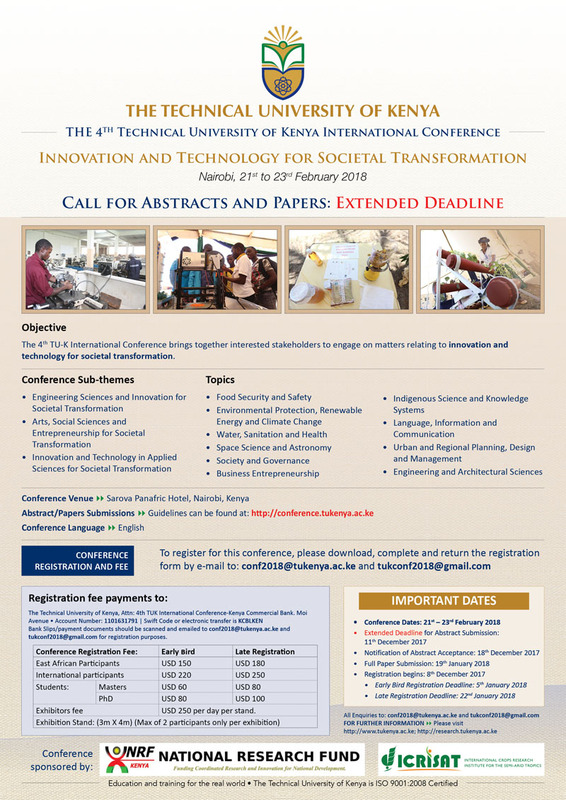 The School of Information and Communication Studies, The Technical University of Kenya and the School of Information Sciences, Moi University have organised the first International Information and Knowledge Management Conference to be held on 24-26 August 2016 at the Sarova Panafric Hotel in Nairobi, Kenya. We have the pleasure to invite you to submit papers for consideration for presentation at the conference. All current residents are advised to check out by 17th April 2016. No personal belongings will be allowed in the rooms after this date. All students wishing to be accommodated in the hostels during the May-August 2016 Semester should apply online from 1st April 2016 to 14th April 2016. Those who will not have applied online by this date will NOT be considered. Please note that terms and conditions for eligibility will apply. During the January –May 2016 semester, The Technical University of Kenya participated in the Nairobi Metropolitan Drama Festivals, which took place on 12th and 13th March 2016. The following six items qualified to proceed to the National Drama Festivals that will be taking place from 4th to 14th April 2016, in Meru. The SCHOOL OF SOCIAL SCIENCES AND DEVELOPMENT STUDIES (SSDS) within the FACULTY OF SOCIAL SCIENCES AND TECHNOLOGY STUDIES (FSST) is in the process of launching a monthly colloquium with the objective of realizing the mission of THE TECHNICAL UNIVERSITY OF KENYA (TUK). The purpose of this memo is therefore to invite you for the first session of the year 2016 colloquium which shall be held on the 19TH FEBRUARY, 2016 from 9a.m. in BLOCK “C” ROOM 30. The Technical University of Kenya is in the process of carrying out four (4) baseline surveys as part of getting feedback for improvement of service delivery. The surveys will be conducted by an external consultant, M/S Sigmund Peak International Limited. These surveys will cover the following aspects; Customer Satisfaction; Alcohol, Drugs and Substance Abuse; Competency and Skills Assessment; and ICT Literacy Level. Applicants must be holders of a Bachelor’s Degree in Business Studies, Commerce or Business Information Technology or equivalent from an institution recognised by the Senate of the Technical University of Kenya with at least an Upper Second Class Honours. Kenya Association of Manufacturers (KAM) invites all Universities and Students to participate in the 2016 Energy Management Award (EMA) - Public institutions and Students Category. The annual award promotes excellence in energy management and recognizes public institutions that have achieved significant reduction in their energy consumption through implementation of energy efficient measures and technologies and students who have come up with innovative ideas on energy management. I take this opportunity to wish all members of staff a Happy and Prosperous New Year, 2016. Your individual efforts, energy, resilience and commitment saw the university accomplish so much, the climax being the 3'd graduation ceremony that was held on December 18, 2015. Students to continue with their studies as TUK seeks accreditation. The Technical University of Kenya has recalled more than 3,000 engineering students whose studies were suspended in August. The students were sent home over a row between the university and the Engineering Board of Kenya over accreditation. Vice-Chancellor Francis Aduol said the university decided to recall the students while it processes the accreditation. “We want the students to continue with their studies as we seek accreditation. It is not a one-day process. We cannot keep the students out for long,” said Prof Aduol. The Department of Chemical Sciences and Technology (DCST) in collaboration with the Kenya Chemical Society (KCS) will be conducting a training workshop for technicians on Chemical Security, Safety and Waste Management in TU-K from 15-17 December, 2015. Students wishing to be considered for TUK Hostel Accommodation in January 2016 should apply online between Wednesday 9th and Friday 18th December 2015. To apply, login to the Student's portal (http://portal.tukenya.ac.ke), then under "Services" link, click "Apply for Accommodation". Kindly print application notification for your own reference. You will be able to check for your status from 21st December 2015. Successful students MUST occupy their rooms by 15th January 2016. We would like to inform you that H.E. the Ambassador of France to Kenya Mr. Remi Marechaux will be visiting the University on Friday 4th December, 2015 at 4.00 p.m. The Ambassador will be giving a public lecture on "Bilateral relations between Kenya and France" at the Main Hall that will focus on past and future perspectives of collaborations, especially in technical and engineering sciences as well as linguistic co-operation. This is therefore to request you to attend and also to urge all students to attend this important lecturer. The Technical University of Kenya seeks to improve the quality of teaching in all its teaching units. To achieve this goal, the INSTITUTION has come up with an online questionnaire to obtain feedback from students on various aspects of teaching effectiveness as an instrument for quality assurance. The Department of Aerospace & Aviation Engineering will be hosting the Kenya Airways Career Fair on Thursday 3rd December, 2015 at the University's Main Hall between 1.30 p.m. to 4.00 p.m.
Kenya Airways (KQ) staff will give a talk on the various job types and job opportunities available at KQ. Although the focus will be on Engineering, other programmes will also be given consideration during the event. This is therefore to request you to attend and also urge all students to attend this important event. All needy students are invited to apply for the Rattansi Educational Trust bursary through the students’ portal ( Services | Rattansi Bursary Form). The application will open from Monday 30th November, 2015 and will close on Friday 11th December, 2015 at 4:00pm. The Technical University of Kenya wishes to announce that its 3rd Graduation Ceremony will be held on Friday 18th December 2015starting 9.00 a.m. at the Graduation Square. Graduands and guests are advised to be seated not later than 8.30 a.m. No entry shall be permitted to the Graduation Square after the stated time. The 3rd TU-K Annual International Conference will focus on advances in innovations and technology in the applied sciences, engineering and social sciences. Centre for Engineering Innovation and Production has recently installed state of the Art equipment for training and production in Mechanical Engineering. This production Engineering Workshop is probably the most comprehensively equipped facility with the most current technology including Reverse Engineering Tools (Rapid Prototyping), Rapid Moulding; Numerically Controlled Machines (Lathes, Millers), Computer Aided Design Labs. On Wednesday, 30th September 2015, Parliament debated The Engineering Technologists and Technicians Bill. The National Assembly Official Report (Hansard) is attached here. This is to inform you that the abovementioned meeting scheduled to take place today Thursday 1st October, 2015 from 3:00pm has been cancelled due to logistical reasons. The TU-K Great Debate will however take place as scheduled on Wednesday 7th October, 2015 in the Main Hall from 2:30pm. You are herby reminded to maintain peace and order during the entire campaign period. This is to invite all aspirants vying for various posts in the SATUK General Elections 2015/2016 to a pre-election briefing by the Deputy Vice Chancellor, ARS on Thursday 1st October, 2015 from 3:00pm in the Main Hall. This is to notify all aspirants that the ballot-papers will be printed from friday 25th September 2015. Anybody with questions/clarification should address to Electoral Board in written before 5pm. We will not be in position to addressed any issue after this date. The students Portal for SATUK Elections is open until tomorrow Friday 18th September, 2015 at 11:00 am. Please note that students who have completed three years in the university while pursuing diploma courses with sufficient proof, that is, with valid (stamped by Admission Office) registration form that they have been accepted into the third year of degree programmes, may apply. NOTE: When applying kindly use your old registration number for Diploma. Safari Foundation launched a project entitled “ Technology for Good” at the Michael Joseph Centre on Thursday, September 10, 2015. The Technical University of Kenya, was invited to the launch.This is an open call for projects that use Cellphone Technology platforms to solve problems in Society. A total of 50 Million has been set aside for this project. Application deadline: October 1, 2015. All the previouslv issued student Identitv cards expired on 31/8/2015. Upon registration for the semester. Registration for all students closes on 25/9/2015 and no, Identity cards will be issued after this date. Campaigns officially begin after a candidate has been duly nominated. No campaigns outside the University Precincts or around Administration block. No bribery of voters and hooliganism threats shall be tolerated. Kindly obtain nomination papers by filling online forms, printing and submitting to various offices as indicated on the forms (forms II- VII). The online forms should be accessed through the student portal (portal.tukenya.ac.ke). Pursuant to the Engineers Board of Kenya (EBK) advertisement that appeared on the local print media on 17th July 2015, listing engineering programmes that had not been accredited by them, the University Senate has decided to suspend the teaching of, and admission to Bachelor of Engineering programmes that require recognition by EBK. The Technical University of Kenya brings to the attention of KCSE cohort 2014 who have been selected by the Kenya Universities and Colleges Central Placement Services (KUCCPS) to pursue studies leading to various degrees and diplomas at the institution that admission letters are now available from university website. Letters for module II students will be printable with effect from Wednesday 5th August 2015. The general reporting date is 31st August 2015, unless otherwise specified in your letter of admission. Students wishing to be considered for TUK Hostel Accommodation in September 2015 should apply online between 3rd and 15th August 2015. You will be able to check for your status online between 31st August and 4th September 2014. Successful students MUST occupy their rooms by 11th September 2015. PLEASE NOTE THAT MANUAL APPLICATIONS WILL NOT BE RECEIVED. 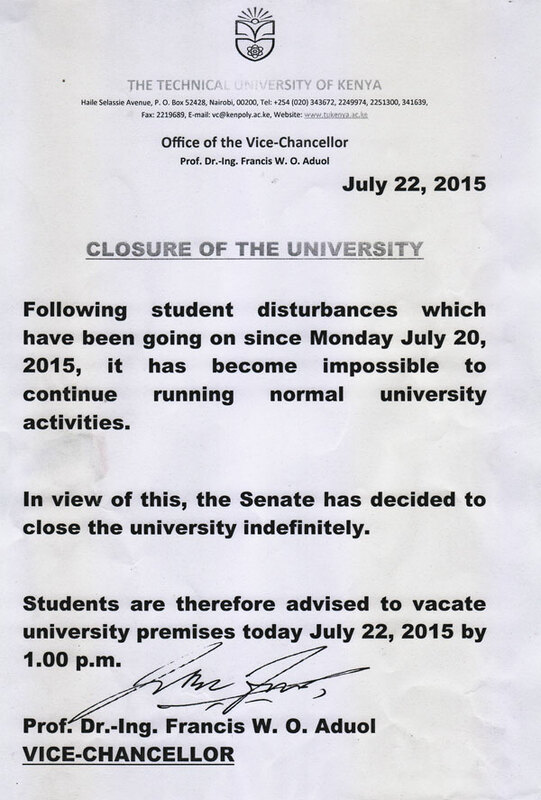 The University has been closed indefinitely. 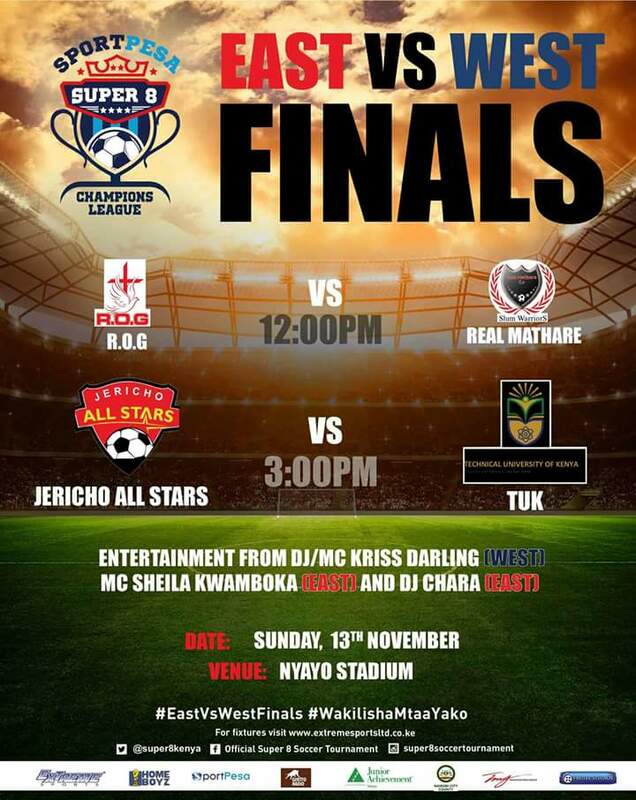 The TU-K Football Team will play Kabete United in the Super 8 Quarter Finals to be held in the City Stadium on Sunday, 12th July 2015. The reporting date for the hostel residents is by 22nd May 2015. You will first clear with the Finance Department and Assistant Director, Accommodation & Catering Services and then report personally to your Hostel Housekeeper with the receipts of the School fees and Hostel Payments duly cleared by 6.00 p.m.
Should you fail to report on the said date and time, your room will be given to another needy student without further reference to yourself. This is to inform all students who took End of Year examinations in April 2015 and are proceeding to the next year of study, that their academic year shall begin on 7th September 2015. The respective examinations results shall be released in due course, and Supplementary Examinations shall be taken in the period of 17th to 29th August 2015. Students are further informed that the Industry Based Learning (IBL) semester shall run from 11th May to 31st July 2015, and those scheduled to take IBL are expected to avail themselves for the same in the said period. Students who wish to be considered for hostel accommodation are requested to submit their written requests to the office of the assistant director accessed at the senior staff common room through the n block short bridge. •	Applications will be received from noon Wednesday 1st April to noon Wednesday 15th April 2015. •	Late applications will not be acknowledged. The Technical University of Kenya has been sampled to sensitize Engineering students on opportunities in the maritime sector by the Ministry of Transport and Infrastructure on Thursday the 26th March, 2015 at 2.00pm at the main hall. All engineering students are invited. We as Safaricom Women in Technology (WIT) have a couple of programs that are currently running nationwide since beginning of 2013. 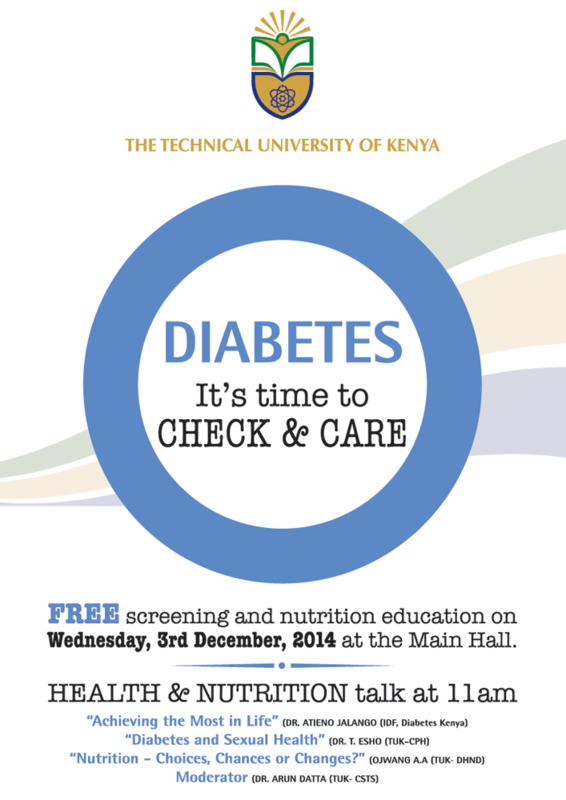 Among the programs is campus outreach targeting the young girls and women in Engineering and ICT related Courses. .
Diabetes - Free screening and nutrition education on Wednesday, 3rd December, 2014 at the Main Hall. Health and Nutrition Talk at 11 AM. Applications will be received from noon Friday 21st November to noon 28th November. Late applications will not be acknowledged. NOTE: The deadline must be observed and no action after the deadline will be considered. The Technical University of Kenya wishes to announce that the 2014 Graduation Ceremony will be held on 18th December 2014. All student ID Cards expired on 31st’ August 2014. 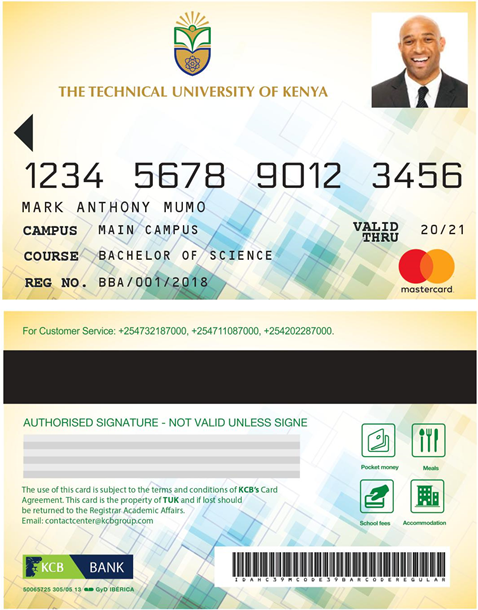 New ID Cards will be issued upon payment of all Semester fees and any fees arrears. Identity card application forms are downloaded from our website. The registration process will end on 3'°' October 2014 and no registration or issuing of Identity Cards will take place after this date. The exercise will commenced on Monday 8"‘ September 2014. The transfer documents will be available from the admissions office upon payment of Ksh. 1,000 processing fees. Duly completed forms should be returned to the admissions office on or 4:00PM before Wednesday 10th September 2014. The successful students will be will be informed of outcome at the end of the exercise. The Technical University of Kenya Health and Wellness Services will be carrying out a VCT drive next week as from Monday 15th to Friday 19th September 2014, 8.00 a.m. to 5.00 p.m. daily. It will take place in tents that will be erected behind Block G.
Counseling, testing and more Information on HIV/AIDS will be provided by VCT counselors. 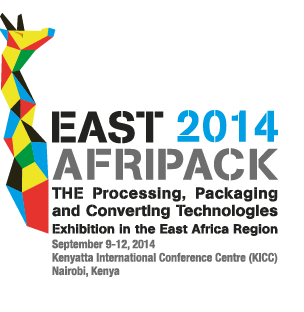 East Afripack is The Exhibition dedicated to Processing, Packaging and Converting in the East Africa Region. The Technical University of Kenya would like to make it clear to prospective students and stakeholders that neither the university nor its representative has sent out application for hostel accommodation. Persons purporting to facilitate prospective students to get accommodation are FRAUDSTERS. Please report to the nearest police station persons pretending to collect monies and fees on behalf of the university. East Afripack is the Exhibition dedicated to Processing, Packaging and Converting in the East Africa Region, a not-to-miss event scheduled in Nairobi, Kenya, to the KICC (Kenyatta International Conference Centre) from September 9th to 12th, 2014. DAAD (the German Academic Exchange Service) is offering up to seven (7) Research Grants for young Kenyan academics and scientists for the academic year 2015/16 in to pursue a PhD in Germany. In addition, together with the Government of Kenya, DAAD offers up to 20 scholarships to staff of public and private universities and public research institutes to pursue a PhD in Germany. The scholarships are open to all fields of research. No age limit! The Master’s degree must not be older than 6 years at the time of the application. Railways project on 5 year contract terms. Prof. Alex Munyasya Muumbo: Prof. Muumbo has worked at the Moi University, Eldoret close to twenty-four (24) years with his latest appointment being the Director, ICT. 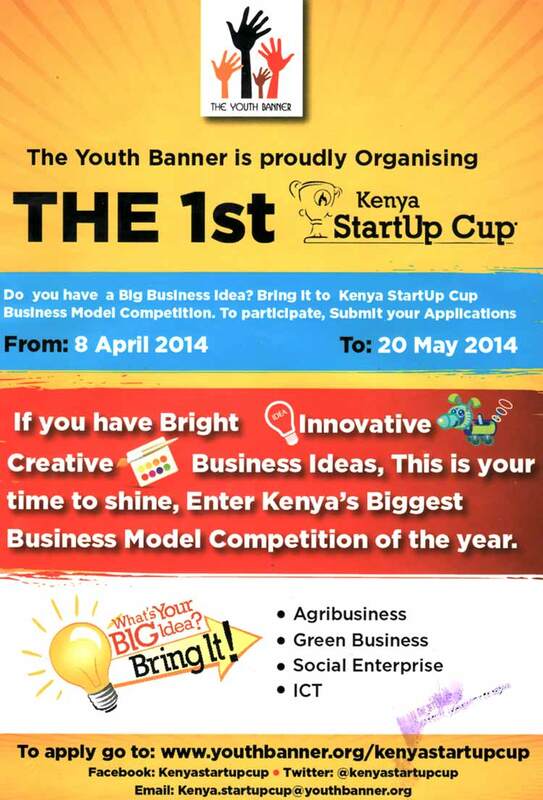 The Youth Banner is proudly Organising the 1st Kenya StartUp Cup. The Korea International Co-orperation Agency (KOICA) has announced scholarships at the following Universities in Korea. We would like to notify the entire student fraternity of the TUK, that Senate has observed that it has not been possible to sustain learning and services at the University due to the prevailing nationwide Universities' industrial action. Consequently, Senate has resolved that the end of semester/term break scheduled to stat on Friday 18th April, 2014 be brought forward to commence today the 17th March, 2014 up-to and until Sunday 30th March, 2014. De Gruyter Saur announces the 2014 annual award for best Libri Student Paper. The fourth annual Commonwealth Summer School will be hosted between the 17-24 August 2014 at the University of Nottingham Malaysia Campus, Semenyih. The School provides a forum to bring together high-quality students from every corner of the Commonwealth to discuss interdisciplinary issues of global importance. This year's programme is themed Global food security; can we feed a growing world? Samsung Service Centre will be offering free Samsung clinic at The Technical University of Kenya from 11th - 12th February 10, 2014. The clinic is to follow up and help clients who have purchased Samsung products and also a boost to the after sale service. The clinic will be free of charge on mobile handsets, laptops and also technical and software upgrades for Samsung products. There will be a meeting for the all club Chairmen on Wednesday 5 that 3.00 p.m in the Director, Students Support Services Office, Administration Block – 4 th floor. I have informed her family and burial date will be communicated later. We wish to send heartfelt condolences to the bereaved family, relatives and friends of the late Ms. Lydia Anyango. May the Almighty God grant her eternal rest. There will be a seminar on Tuesday February 4, 2014. In room N211 (Dept of Physics laboratory) at 2.30pm. Tthis will take about 45 minutes only. Title of the seminar: Prediction of TV Spectrum holes for cognitive radio using artificial neural networks. Deadline for submission is 10th January 2014. Korea International Cooperation Agency (KOICA) is offering scholarship program for international students in Korea. The scholarship is awarded for full time postgraduate study, in Masters in Global Techno and HRD at Korea University of Technology and Education. The scholarship will cover full tuition fees and other expenses. To apply for this scholarship, the applicant should submit the application forms, duly filled, to the Office of the Deputy Vice Chancellor, TIP by 5th December, 2013. Contact HODs for more information on the application requirements and process. Alumni Office welcomes you to become a member of Alumni Association. All graduands are eligible to become members of The Technical University of Kenya Alumni Association. Prospective graduands are encouraged to register online with the Alumni office. Youth, Women and Physically Challenged are encouraged to tender. Technical University of Kenya wishes to announce that the 2013 Graduation Ceremony will be held on 18th December 2013 beginning at 9.00 am. at the Graduation Square at the Main Campus along Haile Selassie Avenue, Nairobi. Graduands and guests are advised to arrive early and be seated not later than 8.30 a.m. no entry shall be permitted into the Graduation Square beyond the time indicated above. The voting should end at exactly 5.00 p.m. as stipulated in the Students Association of Technical University of Kenya (SATUK) Constitution and the counting of votes to start immediately. The facilitator will be Mr Johnstone Mwakazi of Citizen TV. All students and members of staff are invited to attend. 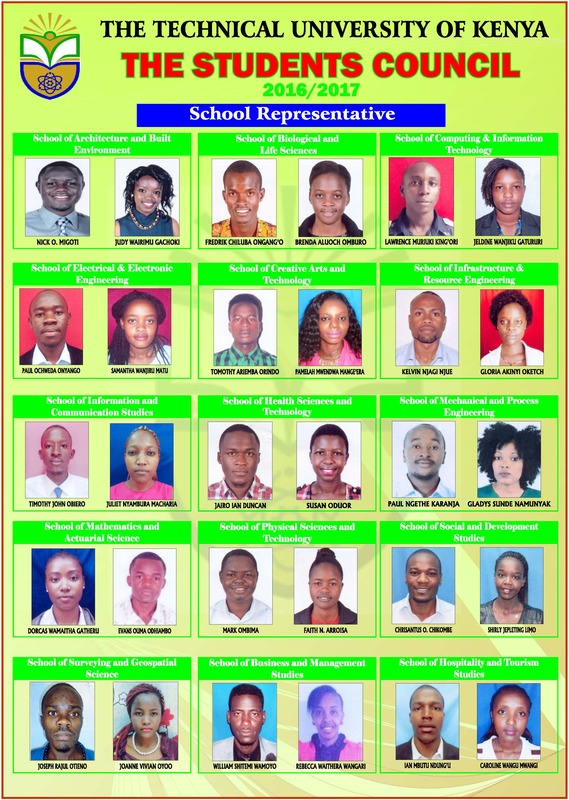 The DVC – ARS- (Academic, Research and Students) will be meeting all the Aspirants tomorrow Friday 25th October, 2013 in the Main Hall at 4.00 p.m.
All the Aspirants are required to bring the names and photos of their Agents to Dean of Students by Friday Mid- day. NO MORE PHOTOS WILL BE ACCEPTED AFTER THE DEADLINE! There will be an urgent polling clerks meeting todayThursday 24th October, 2013 in the Main Hall at 2.30 p.m. The meeting will be brief. Kindly avail yourself. Wednesday October 30th, 2013 presents an opportunity for you as a student of this university to exercise you sovereign right to by voting in the leaders of your choice. 1. Collection of nomination papers from Dean of Students office on 16th October, 2013 as from 10.00 a.m to 3.oo p.m.
2. Returning of duly completed nomination papers to Dean of Students office on or before 18th October, 2013 at 10.00 a.m. by respective schools [not students]. 3. Vetting of candidates by electoral committee on 22nd October, 2013 and their names pinned on the notice boards by 23rd October, 2013. I think the apprentices will be guaranteed a job when we go back, so I think we'll be OK, said Rhys from Bristol. He and his fellow fresh-faced apprentices are huddled around a noisy workbench in Berlin. At just 19, he is one of the youngest in his group at this training centre. Rhys, a keen rugby player, says he is settling into the German lifestyle and has even found a rugby club nearby. He is one of just 2,200 young workers chosen from some 45,000 applicants by the electronics and electrical engineering giant Siemens for its pan-European training scheme. All needy students are invited to apply for the Rattansi Educational Trust Bursary. You are required to attach all the relevant documents e.g. necessary death certificates, fee statements, supportive letter from your area Chief, Pastor etc. and forward the application to the Dean of Students Office on or before Friday 20th September 2013. Graduate students and practitioner with evidence of academic excellence, research ability, good communication skills, and interest in pursuing their dissertation in the field of social entrepreneurship and ICT for development are invited to apply for Hong Kong PhD Fellowship Scheme. Please note that this is the 7 th week since the beginning of the semester/term on 6 th May 2013. The Executive Management of The Technical University of Kenya (TU-K) has however, noted with concern that only a small number of students can be considered as bonafide having paid fees in full. Kenya Library Association is inviting its members and prospective members to attend the launch of the Kenya Library Association Nairobi Chapter on 21th June 2013. 6 th June 2013: 10am – 1.00pm: Meeting of the Students’ Constitution Review Committee to deliberate on all the comments and suggestions made by the students. Technical University of Kenya (successor of The Kenya Polytechnic University College) wishes to announce to her graduates who were conferred with Degrees, and awarded Diplomas and Certificates on 17th December 2012 that the academic certificates are available for collection from Monday 3rd June 2013. The Technical University of Kenya requires accurate data of staff members by department. Information is required in table format so that it can be manipulated to provide different kinds of reports including listing on the website. Please click here to fill out the form. Note: The login credentials are provide in the memo circulated to the respective departments. The Technical University of Kenya Health Services in conjuction with the Teachers Service Commission will carry out a free VCT from Monday 27th to Friday 31st May 2013. This will be held Daily from 8.00am to 6pm. The venue will be the space behind G Block (next to Red Square). The best camp of the world with 500 youth. The University has a very few vacant rooms in men and women hostels. We are requesting the very needy students who are in needy students who are in need for accommodation from 15th-19th April. Drop your application to Assistant Dean of Students Office - D Block. The Kenya polytechnic University College shall be granted University Charter and elevated to full university status by His Excellence, Hon. Mwai Kibaki, C.G.H., M.P., PRESIDENT AND Commander-in-Chief of the Defence Forces of Kenya on Tuesday 15th January 2013. In order to facilitate for the smooth preparation and running of the function, the College Management Board has approved that lectures scheduled to take place on Monday 14th and Tuesday 15th January 2013, be rescheduled.